So, you’re finally taking a trip–or maybe you’re frequently away for work–in any case, you’re going to be leaving your car unattended for some time. You’ve already got someone looking after your pet, collecting your mail, and watering your plants, but is it a good idea to have someone check up on your car? It certainly doesn’t hurt. 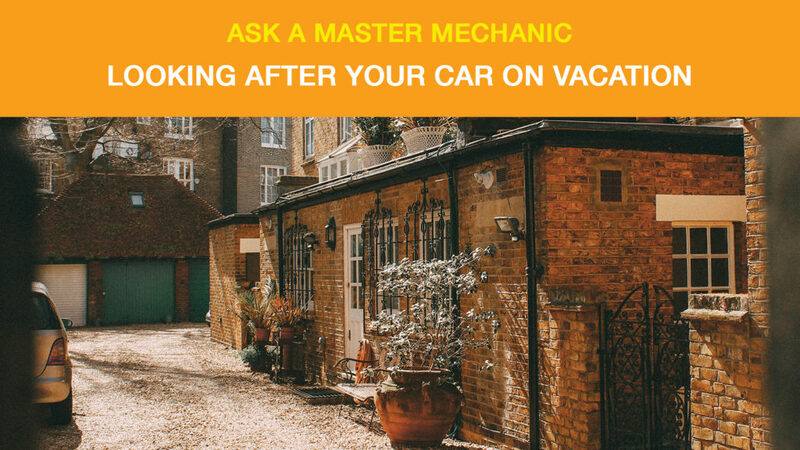 We sat down with a Master Mechanic to find out why, and what you should do with your car prior to leaving. We’ve already covered what you’ll want to do before storing your car for a season, but this has less to do with car maintenance and more to do with common-sense. Whether we realize it, or not, our cars can highlight our daily activity. After a while, people notice when routines change, such as a driveway is empty when a vehicle is usually parked there or if your vehicle hasn’t moved in days. If you’re going to leave your house vacant and your car out, the sad truth is that you could be an easy target for thieves. Make sure you remove any valuables from your car. Even if you have a car alarm, smash and grab thieves can make away with small items pretty quickly. Most importantly, you’ll want to hide your car keys in a safe and secure spot in case thieves break into your home. You don’t want someone making off with your car! While it’s unlikely someone will steal your car, especially if you have a newer model vehicle–it’s still a good idea to have someone check on your car. If something does happen, you’ll want to catch it quickly, so you can notify the proper parties. If there’s damage, your insurance company will want to know when it happened; if there’s theft, notifying the police ASAP will increase the likelihood of catching the perpetrator. Before heading out, Make sure all your lights are off and all accessories are disconnected. Examples are things plugged into the 12v or usb ports because you don’t want to drain your battery. If you’re going away for a few weeks, having someone drive your car around the block several times once a week will keep your battery charged and help prevent the brakes from seizing up. If you vehicle is going to be parked on a level spot, releasing the parking brake can help prevent the brakes/shoes from sticking to the rotor or drum. If you are taking your vehicle on vacation with you, read through your insurance coverage to make sure your car is fully protected while you’re travelling. In Canada, your car insurance may cover you weather-related damage such as hail, however, you’ll need the right type and suitable level of coverage in place. Basic auto insurance coverage, doesn’t provide you with all the protection you might need. Don’t assume you’re covered for water damage, hail, fire or theft. Call your representative and make sure. Side Note: if you’re going to be renting a car while you’re away, make sure your insurance policy covers you. This way you can avoid purchasing unnecessary rental company policies, paying a hefty fine if you’re unknowingly caught without insurance or worse driving without any insurance coverage. Travelling is one of life’s greatest pleasures, but you don’t want to dampen your trip with unnecessary headaches. By taking a few preventative measures, and having someone check on your car, you can make sure you come home to things just as you left them. If you plan to take your car on a road trip or want to have it inspected before you park it for vacation, contact your local Master Mechanic to book an appointment. < Master Mechanic: Can Autonomous Cars Prevent Traffic Jams?